We're sort of just waiting on the parts to come back from powder coat at this point. Lots of little things going on but not much major work. We're reworking the launcher and have added springs to make it easier on the motor to accelerate to top speed. We still have a lot of programming to do before we're sure we can make all the shots we need. We're also making sure that we will have all the parts for the competition robot ready to go once it comes back. We also discussed our "artist formally know as the withholding allowance". The GDC has changed the rule to 45lbs due to inclement weather around the country. We actually weren't planning to withhold that much this year, but with the new rules we probably won't be bagging our collector and launcher bar. We'll have a full drive train and tower in the bag, but we should be able to make lots of modifications to the other parts of the robot. 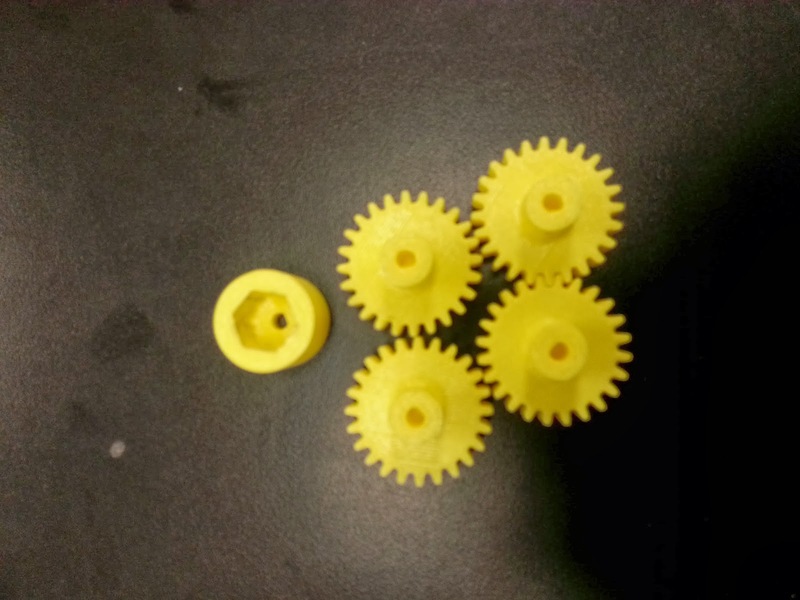 These are some of the 3D printed parts that we have been using this year. There will be a few more as well. We're finding lots of interesting ways to make parts with the 3D printer this year.